Are you being bullied at work? Is someone you supervise bullying you? Is someone you know being bullied? 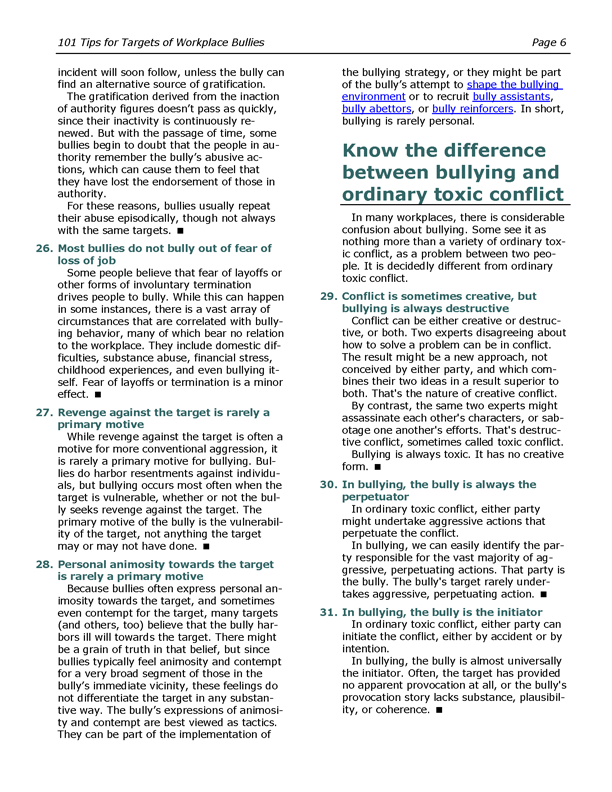 Do you know how to identify bullying behavior? Do you know what to do when you experience bullying? Workplace bullying is so widespread that a 2014 survey indicated that 27% of American workers have experienced bullying firsthand, that 21% have witnessed it, and that 72% are aware that workplace bullying happens. Yet, there are few laws to protect workers from bullies, and bullying is not a crime in most jurisdictions. Here's an ebook that's packed with the insights that targets of bullying need to find a path to survival, and then to finally end the bullying. Are you being bullied at work? Is someone you supervise bullying you? 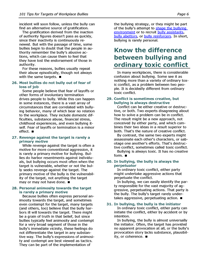 Do you know how to identify bullying behavior? Do you know what to do when you experience bullying? Workplace bullying is so widespread that a 2014 survey indicated that that 27% of American workers have experienced bullying firsthand, that 21% have witnessed it, and that 72% are aware that workplace bullying happens. Yet, there are few laws to protect workers from bullies, bullying is not a crime in most jurisdictions, and few employers have specific anti-bullying policies. 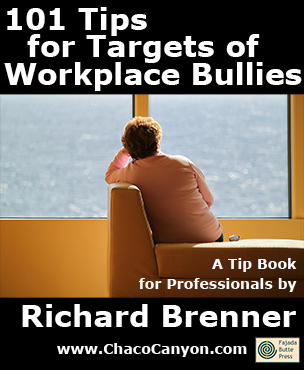 101 Tips for Targets of Workplace Bullies, 10-pack is filled with the insights targets of bullying need to find a way to survive, and then to finally end the bullying. It helps you avoid the traps and pitfalls that await you at work, and it guides you into new choices that can right the wrongs you have experienced. 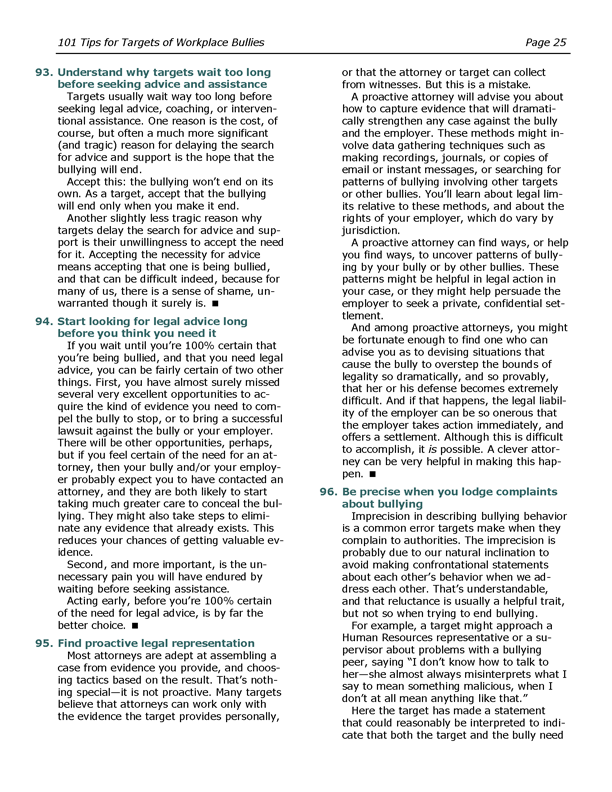 101 Tips for Targets of Workplace Bullies, 10-pack is a collection of short tips that help targets formulate effective responses to bullying. You'll learn techniques that cause the bully to find new targets, and guide the organization towards getting control of its bullies. It gives concrete, nuts-and-bolts methods for dealing with real-life situations. It's a collection of significant size — 34 pages (18,000 words) in all. That's about 1.5 times the size of Who Moved My Cheese?. Counterattacking too feebly is a common error targets make. Bullies know that counterattacks are possible, but since they select "easy" targets, they usually expect feeble counterattacks, if any. Bullies generally don't expect massively coordinated counterattacks. That's one reason why massively coordinated counterattacks are so successful. A massively coordinated counterattack is an attack on multiple fronts, simultaneously. Simultaneity overwhelms the bully's ability to process what's happening, enabling the target to get inside the bully's OODA Loop. An example: filing a grievance with your employer, filing a lawsuit against the bully personally, and filing a lawsuit against the employer — all on the same day. The key principle: when you counterattack, escalate to the max. Hold nothing back. 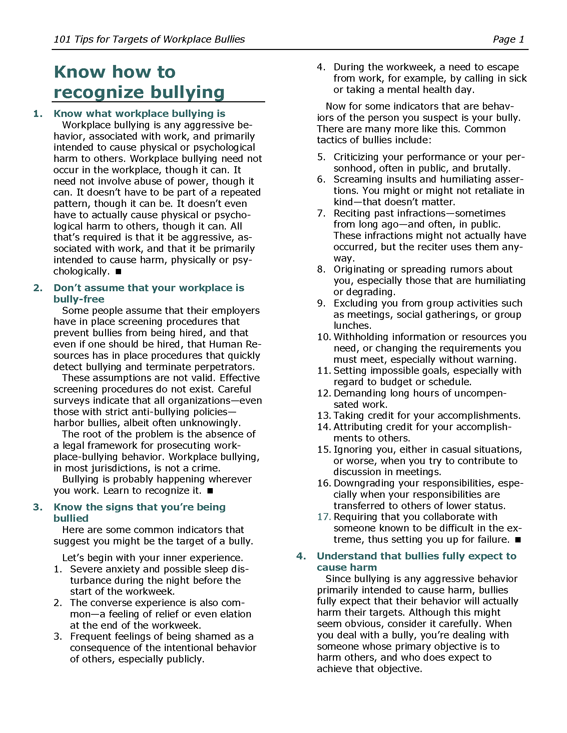 Coordination with other targets of the same bully or other bullies can be an effective way to overwhelm not only the bullies involved, but also the cognizant officials as they try to suppress any evidence of bullying within the organization. To isolate someone socially is to deprive her or him of interaction with others. Since humans do need social interaction, this bullying tactic can be very painful for targets. But in most workplaces, complete elimination of social interactions is impossible. That's why bullies focus on the kinds of interaction deprivation that most effectively enhance psychic pain in the target. Isolating the target from anyone who might provide support, comfort, or sound advice is the highest priority. Next in priority are techniques that create in the target a sense of being excluded. For example, failing to invite the target to meetings, or having the target attend by telephone rather than in person, could create a sense of exclusion. Arranging for the target to work at remote locations facilitates all of these isolation tactics. Supervisors who are bullies sometimes use business travel to isolate targets, especially if the destination is undesirable. But office or cubicle location choices are also useful, if they are remote enough from the target's sources of comfort, support, or advice. Bullies who are peers of the target employ social isolation tactics by excluding the target from meetings or informal gatherings with the target's peers. Bullies whose targets are their own supervisors can create a sense of exclusion by organizing meetings or gatherings of the supervisor's subordinates without involving the supervisor. Understand the paradox of the "easy target"
It is widely believed — mistakenly — that bullies always choose "easy targets" — the defenseless and the weak. While it is true that they do find some easy targets attractive, not all attractive targets are "easy targets." This circumstance arises because of a paradox. People who are not bullies generally don't appreciate that the difficult targets are precisely those who provide the greatest sense of reward to the bully, because successful bullying of such targets provides the most certain validation of the bully's power. Dominating an easy target proves relatively little. That's why bullies don't seek easy targets per se. Rather, bullies prefer targets who provide opportunities for successful outcomes. An individual who is personally strong, but who, for various reasons, is likely to be dominated by the bully, is the most attractive kind of target. Imprecision in describing bullying behavior is a common error targets make when they complain to authorities. The imprecision is probably due to our natural inclination to avoid making confrontational statements about each other's behavior when we address each other. That's understandable, and that reluctance is usually a helpful trait, but not so when trying to end bullying. For example, a target might approach a Human Resources representative or a supervisor about problems with a bullying peer, saying "I don't know how to talk to her — she almost always misinterprets what I say to mean something malicious, when I don't at all mean anything like that." Here the target has made a statement that could reasonably be interpreted to indicate that both the target and the bully need to learn some communications skills, and a recommendation for training might very well be the outcome. The difficulty here is that the target had no such thing in mind, but many supervisors and human resources representatives fail to notice the ambiguity in the wording of the target's complaint. What the target could have said was, "I think she is bullying me. She twists almost everything I say — I believe intentionally — so as to make me seem malicious, when I intend no malice, and when I believe no reasonable person could interpret what I said in that way. There is a pattern of bullying here that I believe the organization must address." But even that direct approach might not work. A typical response to such a charge is to question the complainant's interpretation of events: "How do you know she misinterprets you intentionally?" You can reply to such skepticism by first restating the question in stronger terms: "An excellent question," you might say. Continuing, "How do I know that the misinterpretation isn't just an accident, and not intentional? I think it highly improbable, because if it were accidental, sometimes she would misinterpret me by making the opposite mistake — by believing that I am too nice, or too supportive. It isn't the misinterpretation alone that leads me to conclude that it is intentional; it is the extreme consistency of the pattern and the consistency in the kind of misinterpretation that leads me to believe that beneath the misinterpretation lies conscious intention. I believe she knows exactly what she's doing." Presenting one's case in such stark terms can be very difficult for targets, especially when they have been intimidated by their bullies. But with many supervisors, leaving any opening for a more benign interpretation of one's complaints is likely to result in an unsuccessful outcome. Be precise. Say what you mean. If it's too scary, get help and advice in how to approach the problem. This item is also available by the single copy (USD 9.99 per copy), in 50-copy packs (USD 7.00 per copy), in 100-copy packs (USD 5.75 per copy) and in 500-copy packs (USD 4.75 per copy). 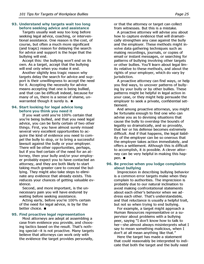 101 Tips for Targets of Workplace Bullies, 10-pack is in Acrobat format, which gives you several advantages. You can print it, and read it like any book. Or in electronic form, you can use the search capability of Adobe Reader to find passages of special interest to you. If you load it onto your laptop, tablet, or other mobile device, you can read it anywhere — and it's weightless, too. 34 pages.